The superb villa interior design in Abu Dhabi is a creative process of creation of a stylish and harmonious space of the room. The talented and experienced experts create the original style. 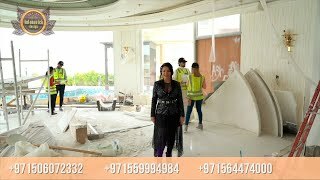 Home design in Abu Dhabi is created in conjunction with your wishes, fantasies, as well as the quality of work performance. The architecture and design company Luxury Antonovich Design offers the exclusive solutions and home decor ideas: elegant and at the same time practical, expressive and at the same time inspiring. Home designers in Abu Dhabi combines the practical facilities with an exquisite beauty. The luxury villa in Abu Dhabi reflects the sophistication and festive mood. The bright design home will always be the height of fashion. The overflows crystal, the flowing lines and facets, graceful columns and splendor of textiles. It is elements of the beautiful and irresistible villa in Abu Dhabi. The design of marble floor is original and crafty. Here, the luxury and elegance are interweaved. The natural marble brings a spirit of grandeur in the interior. The true lovers of the beautiful and elegant interior appreciate the fine veins of the marble and expressive color. Home design in Abu Dhabi pleases the eye of the homeowners and visitors with an excellent idea for an exclusive home. The home decor ideas are unique. Every detail underlines the originality of style, its uniqueness. This style of the villa in Abu Dhabi will make the outside world a new and fabulous. The designers of the studio Luxury Antonovich Design create truly magnificent masterpieces.